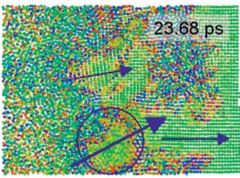 We show that the generation of stacking faults in perfect face-centered-cubic fcc crystals, uniaxially compressed along 001 , is due to transverse-acoustic phonon instabilities. The position in reciprocal space where the instability first manifests itself is not a point of high symmetry in the Brillouin zone. 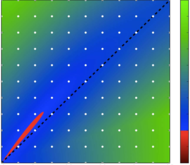 This model provides a useful explanation for the magnitude of the elastic limit, in addition to the affects of box size, temperature, and compression on the time scale for the generation of stacking faults. We observe this phenomenon in both simulations that use the Lennard-Jones potential and embedded atom potentials. Not only does this work provide fundamental insight into the microscopic response of the material but it also describes certain behavior seen in previous molecular dynamics simulations of single-crystal fcc metals shock compressed along the principal axis.